You’ve developed a new cleaning system for your product. Now you have to package that product. The demands on the subcontractor supplying any component for cleanroom equipment manufacturers are changing fast. In the past, a machine shop, plastic extruder, plastic injection molder or custom optics supplier was expected to simply “do what they do” and ship the parts. Now, these same suppliers are being asked to make a part, precision clean it, and then pack the part to be protected in transit. This new demand is forcing a completely different production skill on an ever-increasing — and often bewildered — group. While these new requirements for the medical device and equipment industry are forcing smaller manufacturers to meet complex challenges, the positive side of the subject is that it can serve to open up new opportunities for adding value and attracting new customers. When talking to manufacturers and engineers attempting to make this leap to “clean,” it’s quite obvious that publications such as A2C2 are helping to educate the industry with important information on cleaning systems and methods; now it’s time to also address the packaging part of the equation. Before we discuss the specific bag and how to select the ideal packaging film for your situation, we should look at what packaging does for your product and evaluate the various methods of packaging available. When you enter into a business relationship with a new “clean” customer, their specification should supply considerable detail on what’s expected, but often it is helpful to understand how everything comes together to produce a clean packaged product. Most packaging requirements will specify that the item must be double-bagged or sometimes triple-bagged. The reason for this requirement has to do with how your customer is going to move the part you are supplying into their cleanroom. The normal “cleanroom protocol” would require a wipe down of the outer bag in a controlled-environment area. The package is placed in an airlock from the outside of the cleanroom and then the door is closed. From inside the cleanroom, a technician opens and enters the airlock, removes the outer bag (leaving that bag in the airlock), and moves the product — still packed in the inner bag — into the work area. When the part is needed, the final inner bag is removed when ready for use. It’s complicated, but the procedure ensures that all the work you have done has a value. Keep in mind when planning your budget for packaging personnel that the additional time and expense required in performing the task of double-bagging must be a consideration. The requirement to double bag also provides an opportunity to use two different packaging materials for each layer, allowing you to chose different performance parameters to solve your packaging challenge. Cleanroom packaging films do not have the slip additives that are found in a normal commercial bag, so they will not be as easy to slide past each other, as you would normally expect. Sizing bags for the two layers is important as well. Determining the size of the inner bag is directly dependent upon the size of your product. Allow at least an extra inch on the width, and four to six extra inches in length than is required to hold the product to allow for sealing. Vacuum packing is very important for several reasons when packaging products for cleanroom use. If you start with a clean product and then pack it in a clean bag, and the product subsequently moves around in contact with the inside of the bag, that abrasion causes particles of packaging film to contaminate your clean item. Additionally, if you have a product moving on the inside of a bag and that bag is moving against the outer bag, the opportunity to develop large static electric charges exists. As you doubtlessly know, static charges on an insulating item will attract particles from all directions. Ambient air left in a package can also hold moisture that can contaminate or oxidize your product. Vacuum packaging will keep your product cleaner, hold down static charges, make packing easier and reduce moisture damage. In situations with very sensitive moisture issues, packaging machines with a dry-nitrogen purge cycle can also be employed, adding an extra level of protection. Particle contamination will invade your packing area if you don’t follow a rigorous cleaning protocol in this critical area. The most fundamental idea that you must instill in your workers is that they must continually clean their work areas throughout the day to the point that it never appears to need cleaning; it may sound like twisted logic, but each workstation must appear to be clean even before the employee begins to clean it. Static attraction on your product and the packaging film will pull particles into the package, so your packer is also one of your most important inspectors. It’s amazing how big a very small particle will look when vacuum-packed between the inner and outer bags. This is a location where the use of concentrated airflow and ionization will pay for itself very quickly. Contact contamination transfer to your product and to bags is a challenging training issue even for experienced cleanroom workers. Technicians must recognize how easy it is to touch a contaminated article — even something as seemingly innocent as an anti-static bag, for instance — and then touch a clean product. 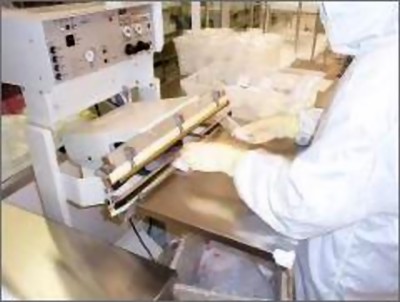 If your pack includes anti-static bags, a procedure should be used that isolates the product from surface contamination by bagging and sealing all of a batch of product with the standard (non-anti-static) bag and then, as a second process, apply the outer anti-static bag, taking care to limit the contact of the anti-static bag to the work area. Upon completing any work where contact is made with any suspected contaminated surface, gloves should be washed or changed. The technician should also take steps to avoid contact with his or her garment followed by contact with the product or work surfaces. As you can see, this can become complicated, but the key to success is having a workforce that is well trained so they can recognize all the possible sources of contamination. If you are not totally frightened away at this point by what we have discussed about the cleanroom packaging process, we’ll proceed to take a closer look at the packaging film you will use. The key to making a successful choice in packaging films is first looking at the challenges your product gives you. You will need to develop requirements for strength, particle cleanliness, ionic cleanliness, moisture and gas barrier, and budget. As each performance parameter is developed, please remember that you can drive costs up by over-specifying, and that can be as dangerous as under protecting the product, at least to the accountant. 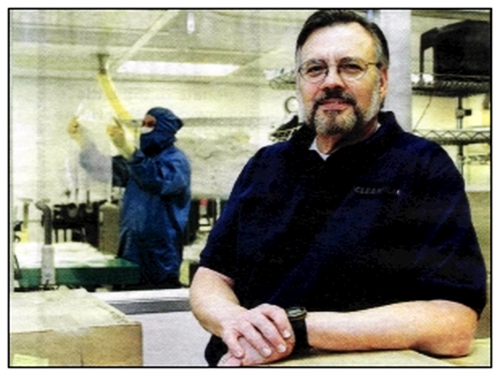 The workhorse of cleanroom packaging films is polyethylene, referred to within the industry simply as “poly.” Due to the new high-performance polys available, it is also becoming the answer to extremely critical packaging challenges. Additionally, it is one of the most readily available materials, making your purchasing people happy. Its biggest problem is the softness of the surface that can be abraded by hard or sharp edges on the product being packaged. The use of vacuum packaging methods does help reduce the potential of this problem. Nylon 6, the purest of the nylon resins, was looked on as the best product for packaging hardware and metal parts due to its abrasion-resistant hard surface, but some ionic concerns must be considered when using this film. Nylon is also the top performer as a gas barrier, making it ideal for vacuum packaging applications. In double bagging processes, nylon is often used as the inner bag, in combination with a poly outer bag. This gives a good balance between performance and value. An interesting attribute of nylon is that it is “hydroscopic”; it uses the available water vapor as a “plasticizer,” making it flexible. This means that it will not contribute to moisture-barrier performance and actually attempts to equalize the humidity on each side. Nylon is a film capable of working in high heat situations and is used as a component in some process applications. Poly and nylon have anti-static versions available that are often used in cleanroom packaging to reduce the danger of a static event or to stop the electrostatic attraction of particles. In spite of the extensive warnings that we have discussed, the product you are packing has to guide the choice for anti-static films. The process of evaluating the packaging needs of your product and prioritizing them by importance to the quality preservation of your product will make this easier. Anti-static bags are often used as the outer bag to add static protection without coming into contact with the clean item. Furthermore, in cleanroom construction and remodeling, anti-static sheeting can be employed to wall off or protect areas during work. In the event of a fire, anti-static nylon sheeting is self-extinguishing, which adds an extra margin of safety. Depending on the nature of the packaging challenge, a number of other films and laminated materials are available beyond the few we have mentioned. The best approach to a complicated packaging challenge is to recruit help from your vendor and be very honest while evaluating the packaging needs of your product. “Stick to your core competency” may be a hackneyed phrase, but in the case of a critical product and the packaging used to protect it, it can only serve you well to let your packaging supplier provide the ounce of prevention that keeps the pound of cure from becoming necessary. Copyright © 2001-2018 by Stephen W. Van Someren. All rights reserved.